The Midwest had a number of outstanding performances turned in at the Intercollegiate Tennis Association All-American Championships this past weekend. The men’s tournament, held in Tulsa, Oklahoma, featured a quarterfinal finish in the main singles draw from the University of Illinoi’s Jared Hiltzik while the Illini tandem of Tim Kopinski and Ross Guignon achieved victory in the doubles consolation bracket. Hiltzik started his All-American Tourney run on Thursday morning where he defeated UNLV's Ace Matias 7-5, 6-3. After a short break, Hiltzik was back at it, this time getting the best of Duke's Fred Saba with a 6-2, 6-3 victory. On Friday, the sophomore squared off with his first seeded opponent of the tournament in seven-seed Ray Sarmiento of USC. He then delivered his third consecutive straight-set victory of the tournament with a 6-2, 6-2 win. In the quarterfinals, Hiltzik was halted by eventual winner and 12-seed Mitchell Frank of Virginia. Frank got the best of the Wilmette native with a 6-2, 7-6(5) win. "Jared got back to finding his equilibrium on the court. It's a critical component for him knowing where to be," Illinois head coach Brad Dancer said. "His next step is to maintain where he needs to be from a composure stand point and implementing the things he learns at practice." In the doubles draw, the seventh-seeded Illinois team of Ross Guignon and Tim Kopinski suffered some deja-vu from last season's NCAA Tournament, falling 8-4 to Vanderbilt's Gonzales Austin and Ryan Lipman. However, Kopinski/Guignon displayed resilience and bounced back nicely in the consolation bracket. 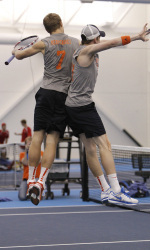 After earning victories against teams from SMU and Elon, the Illini duo grinded out a 8-7(1) win against Big Ten foes Peter Kobelt and Kevin Metka of Ohio State. Then, the Orange and Blue crew delivered a hard fought 6-4, 0-6, 6-1 win over Lloyd Glasspool and Soren Hess-Olsen from Texas in the finals. "Their intangibles are fantastic," Dancer stated. "If they can improve the bread and butter of their serving games they are going to be a really good doubles team." The women’s tournament, held in Riviera, California, saw University of Michigan Junior Emina Bektas (Indianapolis, Ind./New Braunfels) and senior Brooke Bolender (Delray Beach, Fla./Kaplan) of the University of Michigan women's tennis team in the doubles back draw at the Riviera/ITA All-American Championships at the Riviera Tennis Club. With the win, the tandem qualified for the ITA National Indoor Championships later this fall. The Wolverine duo, ranked No. 3, fell in the first round of the main draw to No. 15 Whitney Kay and Caroline Price of North Carolina, 8-1, on Thursday (Oct. 3). Entering the consolation draw, Bektas and Bolender earned a bye in the first round and defeated No. 10-ranked Dominique Harmath and Natalie Beazant (Rice), 8-4. 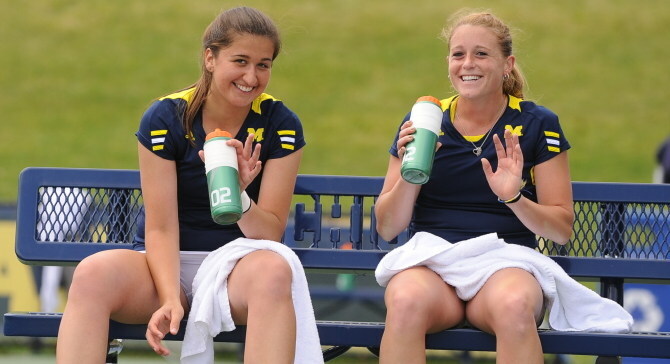 After the team from Utah had to withdraw, the Wolverine pair advanced to the final. U-M knocked off No. 26 Kendal Woodard and Megan Kurey of Georgia Tech (8-5) to earn the berth to the national championships. Bektas advanced to the quarterfinals of the singles main draw after knocking off No. 5 Annett Schutting in straight sets, 6-2, 6-0, on Friday morning (Oct. 4) in the second round. Bektas took an early two-break lead in the first set to go up 3-0 en route to the 6-2 win. The Wolverine junior, ranked No. 25, coasted to the second-set victory without surrendering a set. It was a revenge of sorts for Bektas, who was eliminated from the same tournament by Schutting last season. Bektas won her first-round match over No. 30 Stefanie Tan of TCU (7-5, 6-0) on Thursday, marking her first win in the main draw at the All-American. Her tournament run came to an end on Friday afternoon when Cristina Stancu of Texas A&M topped her a 7-6, 6-1 win in the quarterfinals.